Pax 3 vaporizer is an advancement of the previous vaporizer, which has been introduced by the Pax Lab, known as Pax 2 vaporizer. The equipment possesses the quality of muting out all the extracts of your desired dried herb and turns it out into the form of vapors. Although, the exterior of this instrument has been designed in such a way that it looks like a lipstick, because it contains a slim, sleek and polished surfaced body, while the interior mechanism and mode of action does not differ greatly in terms of its activity from the previous version of Pax 3 i.e. Pax 2. The product takes up approximately 30 seconds to heat up, after insertion of your desired dried herb into the oven part of it. 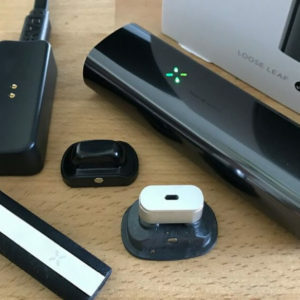 It is also provided with the Bluetooth connectivity option as well, which enable the instrument to be controlled through an App and you may select your desired flavors, temperatures and other features via the app. For those, who have already been using the previous version i.e. Pax 2 vaporizer, will find it a bit easier to get used to of the process of working of Pax 3 vaporizer as well, as there are total 5 steps present in its working. The initial 4 steps are similar as the steps that were provided in Pax 2 vaporizer, while the 5th one is the additional one in it. This step allows you to set the temperature of your desire and you may select any of the customized temperatures from its menu. In order to make this thing work, first of all, you have to open the oven chamber of this product, and then insert the ingredient of your choice; this ingredient might vary from dried herbs to concentrates etc. To make it work, you to turn on the device by pressing up the center of the mouthpiece, which is located on top of this unit. Afterwards, select the temperature of your desired range, this can be done by holding and pressing out the power button for a few seconds, until the device gets turned on and it shows the green light, then there will pop up a menu bar over the device, from which you will be able to select your desired temperature. There will be 5 different options to choose for your desired temperature, the first four of them are same as the previous Pax 2, while the 5th one gives you the option of selecting your customized temperature. In order to select one out of these 5 options, lightly hold and press the power button, select your temperature, and then get yourself exit from this menu bar. If you wish to select the temperature of your own choice by choosing the 5th option, the device will make you connected with an app, via Bluetooth, through which you will be able to select the temperature of your own choice. Now, the device will be working on its own and it will automatically reachup to your selected, desired temperature. To completely heat up the device, it takes approximately 15 seconds to make the device reach up to your desired temperature. This is the modified feature of Pax 3 that it takes less time to reach up to the desired temperature as compared to Pax 2 which used to take a bit longer. After the device is ready and is reached up to the temperature, the device will vibrate and all the lights will turn on, this is an indication for you, that the device is ready to be used and you may now take draws from the mouthpiece. In case you want to use concentrates as a flavoring agent, you will have to add the concentrate in oven chamber of the device, and set the temperature on highest setting i.e. setting 4. In this process, the concentrate might stick to the bottom of oven chamber, but this is how it works, and you will be able to easily remove out of the device once you are done. Standard: This one is the basic setting for using Pax 3. This mode works by providing you the additional feature of rising up the temperature up to 5 degree Celsius, whenever you take a draw from the mouthpiece, in order to regulate the desired temperature, and then it drops down back to the previous temperature which has been set in the device, in order to maintain the temperature. Flavor: This mode is also quiet similar to standard mode, but it works more effectively. In this mode, whenever you wish to draw from the mouthpiece, the device will immediately increase the temperature up to 5 degree Celsius from the normal temperature, and once the draw is over, it will immediately dropped down back to its previous temperature. This rapid heating and cooling of the device, allows you to safely use the flavor or herbs, and prevent the wastage of your flavor if, due to any case, you prevent to take a draw from the device for a while. Boost: The Boost mode allows you to have a rapid increase in the temperature aggressively. This setting is ideal for thosewho wants to take rapid and vigorous draws from the device, and wanted the effects of these draws to be quiet harsh. To achieve this feature, you might want to select the boost setting, as it rapidly increases the temperature while drawing, and slows down the time for cooling back down. Efficiency Mode: Efficiency mode is ideal for those users who wish to draw small and light puffs from the device, as it slowly rises up the temperature up to 1 degree Celsius constantly over the course of your session. Stealth Profile: As the name indicates, this mode is used when you do not want to highlight or show up your device in front of everyone, as it dims down all the lights of the device, and also it provides aggressive cooling down effects, to keep the odor minimum.